"Fugue for Tinhorns" "A Bushel and a Peck" "Guys and Dolls" "I've Never Been in Love Before" "Luck Be a Lady" "Sue Me" "Sit Down, You're Rockin' the Boat" "Marry the Man Today"
Sports columnist and short-story writer Damon Runyon was the louche poet laureate of the desperate denizens of Times Square, and his characters seemed perfectly suited to a colorful musical comedy. Songwriter Frank Loesser, producers Cy Feuer and Ernest Martin, book writer Abe Burrows, and choreographer Michael Kidd shared something else besides their devotion to the works of Runyon: they were all native New Yorkers and understood Runyon’s urban milieu perfectly. 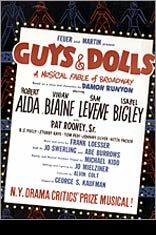 Their adaptation for “Guys and Dolls” leaned heavily on a Runyon story, “The Idyll of Miss Sarah Brown,” which depicted an incongruous romance between an inveterate gambler named Sky Masterson and a Salvation Army-type missionary girl, headquartered in the theater district. Sky, who can’t refuse a wager of any kind, is bet by another gambler, Nathan Detroit, that he can’t romance the straitlaced missionary, Sarah Brown. Meanwhile, Nathan has troubles of his own, trying to set up a floating crap game while avoiding the wrath of his fiancée, a brassy chorus girl named Miss Adelaide, who is desperate to marry Nathan after a 14-year engagement. Other colorful Runyon characters — driven gamblers, petty racketeers, and chewing gum-smacking showgirls — were drafted in from a variety of stories, and the universe of the show was generously and jocularly fleshed out. After its opening in November 1950, “Guys and Dolls” became one of Broadway’s most enduring successes, running 1,200 performances and enjoying successful revivals all over the world, including three on Broadway alone. The show was miraculously able to mock the desperate denizens of Dream Street and celebrate them at the same time; it took Runyon’s Broadway of legend and turned it into a legend of Broadway.